The Chukar Partridge (Alectoris chukar) is a gallinaceous gamebird, related to pheasants, grouse, and quail. 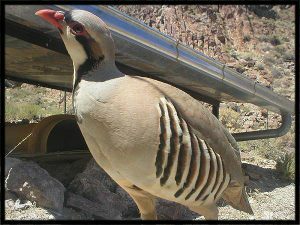 Chukar have come a long way since then and have a wide and varied distribution throughout the west, often living in inhospitable areas. They prefer inclined slopes with cover such as rocks, cliffs, and brush as well as lush grasses and forbs in which to dine. While not mandatory for survival, running or still water sources can be detrimental in years of drought, and higher populations generally occur in these areas. Chukar are fast flyers and even faster runners. WHAT THE UCWF IS DOING? 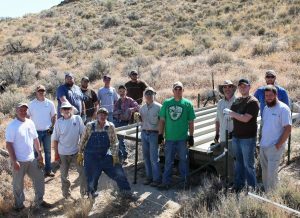 Through volunteer work and sponsored efforts, the UCWF as well as other conservation partners, have constructed dozens of these water catching devices in Utah. 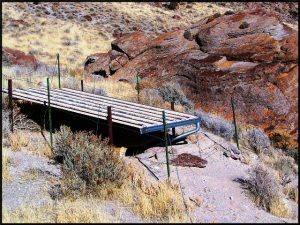 With your continued support, from both funding and much needed volunteer work, the Utah Chukar & Wildlife Foundation will be able to install more of these “Desert Oases” in the future. Please visit the JOIN US page for more details. A guzzler is simply a device that holds rain water for utilization by wildlife. A guzzler consists of a large water gathering platform, usually corrugated steel roofing, which is placed at a slope and used to funnel the water into a holding tank. These guzzlers are particularly useful in desert climates where surface water is scarce. Guzzlers in Utah have been known to host dozens of species of native birds and mammals, as well as reptiles and amphibians. They can be essential to desert survival, particularly in years of drought and famine.